✓ it wipes clean easily. ✓Great size and even greater value! Can be cut to size worked as expected. ✓Wonderful for your craft area, Keep your work space clean, For all your crafting needs! ✓Teflon sheets for sewing/applique, heat pressing, stamping, ironing and baking, metal clay, polymer clay, HTV, wax and a lot more. ✓These Craft Mat can serving as barbecue grill mat, nonstick oven liners, iron clothes protector, heat press transfers and other crafting projects. ✓PTFE sheet can be applied in Arts, paint and other projects processing, suitable for wide range of crafts course. ✓Simply place it over the HTV and iron away, when applying heat transfer vinyl to shirts and other items, It never sticks! ✓You can get what you pay for and more! ✓Shovan - Do what we say, say what we do. NON-STICK TEFLON HEAT TRANSFER PAPER --- 5 Pack Non-stick teflon Heat Transfer Paper Protects your vinyl, clothes and iron while you iron on HTV with our professional grade. TEMPERATURE RESISTANT & WATER REPELLENT --- Heat resistance up to 600 degrees. Protect your working surface ,Perfect for Heat Press! REUSABLE & DURABLE EASY TO CLEAN AND TRIM FOR CONVENIENT USE --- Craft sheet can be utilized many times both sides, Just wipe paint, glue, wax, baking clay and more when finished. 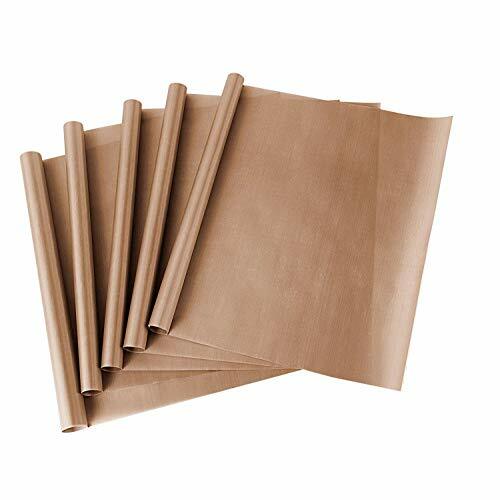 MULTI-PURPOSE CRAFT ITEM --- PTFE sheet can serving as barbecue grill mat, nonstick oven liners, iron clothes protector, heat press transfers, paints and other crafting projects. QUALITY GUARANTEED! --- Promise 90-day Products Exchange and Money Back Guarantee. If you have any questions about this product by SS SHOVAN, contact us by completing and submitting the form below. If you are looking for a specif part number, please include it with your message.